Is It #TimesUp for Amyloid? Industry is in the business of developing products. For Alzheimer’s disease this has proved to be a significant challenge. 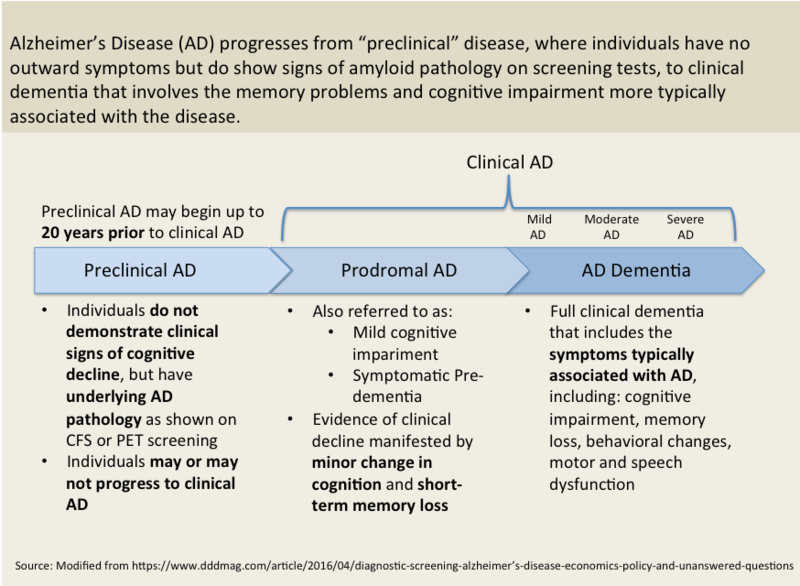 Decades of effort and billions of dollars invested on developing drugs to slow or halt the progression of Alzheimer’s have all failed.In fact, only five drugs in two classes have been approved for cognitive decline in AD, and nothing since 2003. From 2002-2012, 413 clinical trials were conducted and 99.6% of them failed.3Of the 54 compounds tested during this time only memantine made it through FDA approval.3 In 2015 the North American market for AChEIs was $837 million and $1.4 billion for NMDA receptor antagonists. Unfortunately, in Biogen’s PRIME trial of the anti-amyloid therapy, while the drug actually did reduce plaques there was no improvement in cognitive capabilities of patients, and the trial and drug failed. In June 2018, Biogen’s Phase II trial of a BACE drug (elenbecestat) targeting amyloid, showed similar results. The drug decreased amyloid but had no effect on cognition. And on March 21 this year Biogen and Eisai announced they would terminate the Phase 3 ENGAGE and EMERGE trials of aducanumab for early Alzheimer’s disease. There is consensus from scientific investigators to industry leaders that one of the biggest reason for failures to date is that we have not treated AD patients early enoughin the course of the disease to be able to halt the progression. Treating the right patients, at the right time.Appropriate diagnosis of AD has been difficult historically. Until recently diagnosis was made on subjective cognitive indicators. More recently PET scans and CSF (cerebral spinal fluid) tests have been developed to provide objective data on amyloid plagues, and amyloid precursors in the spinal fluid. Still, only 14% (5 million of 35 million) of patients with dementia have AD (NIH FY2019 Bypass Budget Report). People with amyloid plaques in their brains may, or may not, go on to develop AD. In addition, patients’ stage of disease can be misdiagnosed. We don’t fully understand the basic mechanisms and progression of the disease and there are currently no good biomarkers for diagnosis or tracking disease progression. If patients’ pathology (plaques and tangles in the brain) and cognitive decline has progressed too far the therapeutic won’t be able to overcome the damage already done, rendering it ineffective. There are currently only two approved diagnostics for AD, both measuring amyloid beta levels in different ways.4One through PET imaging, where radiolabeled molecules or tracers bind to amyloid in the brain to enable visualization of amyloid in the brain. The other method is through extracting cerebral spinal fluid (CSF) from the patient through a lumbar puncture (spinal tap) and using protein assays measure amyloid levels. In addition to amyloid beta diagnostics, Tau diagnostics are beginning to emerge. Both PET and CSF-based methods can be used to measure Tau. PET imaging is expensiveat $6,000-$8,000 out of pocket for one scan, and in short supplyas the scanners cost a lot to build and run. CSF-based diagnostics are slightly cheaper ($3,000-$5,000) but spinal taps to extract CSF are invasive and painful. In 2015, the total North American AD diagnostics market was $8.5 million.4 This is a striking example of the chicken and egg challenge in diagnostics. Diagnostics are not typically reimbursed by healthcare unless there is a therapeutic intervention that can change the outcome of a disease. So, until an effective therapy is available, no one will pay for the diagnostics and therefore no company will invest in developing a diagnostic. The current diagnostics are used primarily for clinical trial enrollment, determining which patients are appropriate for an AD study. This explains the very small revenue amount of marketed diagnostics. There is an urgent need for sensitive, simple, and inexpensive diagnostics. Right now, we have diagnostics based on spinal fluid testing and we have PET imaging. Both are challenging from a cost, accessibility, and specificity perspective. Preventative therapies for Alzheimer’s disease require the development of biomarkers that are sensitive to subtle brain changes occurring in the preclinical stage of the disease. Early diagnostics is necessary to identify and treat at risk individuals before irreversible neuronal loss occurs. The consensus is that simple, blood-based diagnostic tests are needed and that existing neuroimaging and CSF-based tests are not sufficient. Unfortunately, diagnostics is a difficult business model. It takes almost as much money and time to develop a diagnostic as to develop a therapeutic, but you cannot charge the premium needed to get a return on that investment. Who will lead this charge? Decades of effort and billions of dollars have been invested in developing drugs targeting amyloid to slow or halt the progression of Alzheimer’s. All have failed. The current theory is that we need to treat people much earlier in the progression of the disease, perhaps as early as 20 years prior to symptoms appearing. If no successes are seen with existing amyloid-targeting drugs in Phase 3 clinical trials, we are 15+ years away from a treatment. A major challenge in making progress is the complexity of the disease, and the limited understanding of the biology and underlying mechanisms. There are no diagnostics available that are sensitive, simple, and cost effective. This creates barriers from early diagnosis and treatment, to better clinical trial design and early indicators of drug efficacy. Alzheimer’s Disease Therapeutics and Diagnostics Global Markets 2016, BCC Research.